Added on 13 June 2018 . By Laura Hudson. As a rule, Edinburgh isn’t one of those cities where people like to get all dressed up for dinner. Priding itself on laidback, simple chic, it’s often safer to go out for dinner following the ‘jeans and a nice top’ concept than to go all out and get fancy and face the fear of being the most overdressed person in the restaurant. When it comes to Gaucho, however, these sorts of concerns cease to exist; Gaucho is made for dressing up. Set on the blossoming St Andrew Square, Gaucho’s small exterior presence can be overshadowed by the bustling outdoor terraces of its big-name neighbours Dishoom, The Ivy on the Square and The Refinery. Perhaps due to its smaller and darker appearance, it doesn’t strike a passerby as the most obvious place to go for a lavish meal. Nevertheless, once you are led down from the sophisticated cocktail bar on the ground floor to the restaurant at the lower level, you suddenly wonder why you haven’t been here before. 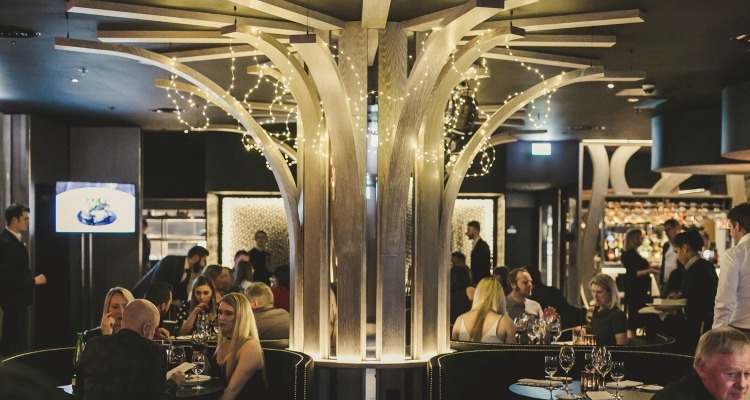 Gaucho have gone for opulence in a big way when it comes to the decor; plush dark seating and squashy banquettes, extravagant light fittings and eye-catching wooden columns designed to look like trees, interwoven with twinkling fairy lights. You might be on the basement level, but it still feels light, luxurious, and larger than you might expect, with a space for a glass-walled private dining room in one corner. We were welcomed warmly by Chiara, who, in a very glamorous yellow dress, made me feel certain that dressing up was actively encouraged here, and everybody who came in after us had clearly gotten the sartorial memo too. With stunning central columns and stylish decor, Gaucho is a place to see and be seen. Recommended by our fabulous waiter, Nuno, we started the evening with a bottle of Selección G Finca Sophenia 2017 (£28.95), the sauvignon blanc specifically produced for Gaucho restaurants. Fresh and leafy yet distractingly creamy and mellow, it was a dangerously drinkable option for a weeknight. Nuno led us through the menu, talking us through the provenance of Gaucho’s beef – 28-day wet-aged Aberdeen Angus sourced from the fertile Pampas area of Argentina, with every piece able to be traced back to the farmer that reared it. We were brought a wooden platter with every kind of steak the restaurant serves in its raw form, with Nuno guiding us through the options and the specifications of each cut, before leaving us to make our decision. We started with the Tuna Ceviche (£13.45) and the Salt Beef Crostini (£9.95), along with a selection of sourdough breads and cheesy Argentinian scones, smeared with warm butter and fresh chimichurri. The ceviche came as in soft cubes of raw tuna, piled high on a bed of creamy guacamole and dressed in a light soy, ginger and jalapeño sauce. The salt beef came on a slab of toasted sourdough, with an Instagram-worthy poached egg, zingy tomato salsa and a large dollop of surprisingly mellow horseradish cream. Mains are where Gaucho really shone. It’s primarily a steak restaurant, so while there are other options on the menu, I implore you: just order the steak. My partner chose a 400g ‘ancho’ ribeye, medium rare (£33) with a peppercorn sauce. Swung by our waiter’s impassioned monologue on it, I opted for the 300g ‘tapa de ancho’ ribeye (£27), aka ‘the top of the ribeye’, with a pot of béarnaise. For sides: thin chips, fat chips, broccoli tossed in stilton and almonds, and mushrooms, which had been confit in beef fat, garlic, chilli and thyme. Go hard or go home and all of that. The ribeye was velvety and perfectly pink - the kind of steak that you would send photos of to the group chat. The tapa de ancho, though… Good grief, I have never tasted a steak like it. It was a smaller portion to the eye, but don’t let that fool you, it’s more than enough for one person to handle. With a wonderful charcoal flavour, it tasted like it had been lifted straight off the barbecue, but with the texture of being slow-cooked for hours - impossibly soft, melting away, and just a delight to eat. It nearly caused a full-on fork war, as my partner wanted to keep sampling it and I just did not want to let him. This lady was not for sharing. 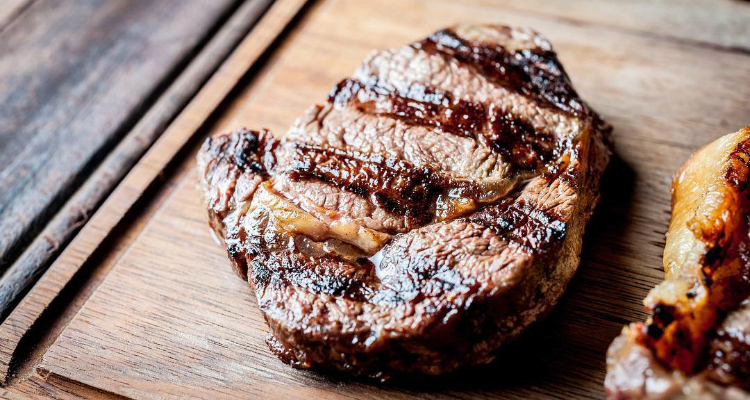 When it comes to the meat, you can put your trust in Gaucho to get it spot on every time. One thing that Chiara promised us before we ordered anything was that “we wouldn’t leave hungry”. She wasn’t kidding. Dessert threatened to take us over the edge, but the menu just sounded too good to pass on – and Nuno’s second impassioned recommendation of the night, this time for the Dulce de Leche Cheesecake (£9.95), just couldn’t be ignored. My partner chose the cheesecake and I had the Chocolate Truffle Torte (£9.45) - both incredibly indulgent, utterly delicious and entirely unnecessary. No regrets. The cheesecake came with hot salted dulce de leche, poured over at the table, along with whipped toasted marshmallow. The balance of sweet and salty was, as you’d expect, sheer joy, and after my first nibble ‘for review purposes’, I found myself going back for more. The chocolate torte was similarly sumptuous, served with a thick smear of dulce de leche and a scoop of alfajores ice-cream (honey, hazelnuts and almonds). Luckily, the desserts weren’t as hefty as everything else, otherwise we’d have really struggled, and there was no way I was allowing plates to go back to the kitchen with pudding that good still on them. We finished our meal with a cocktail, a Manhattan (£11.75) for him and an espresso martini for me. Suitably strong, they perked us up after such an indulgent meal, and we stayed much longer than we anticipated, sipping them and just generally having a fabulous time. 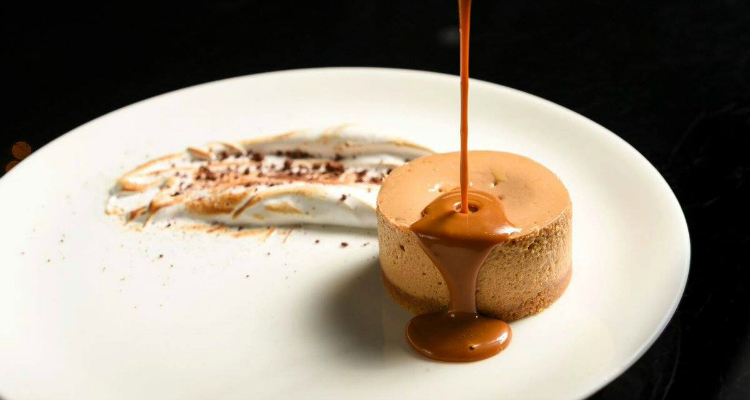 Dulce de-lectable: the restaurant's signature cheesecake in action. I couldn’t fault our experience at Gaucho. The service was friendly and welcoming – attentive without once getting in the way of either conversations or mouthfuls of food. We felt incredibly well looked-after and that nothing was too much trouble. It’s not the cheapest of dining options in Edinburgh, but that level of warmth and conscientiousness really helps you to feel that you’re in an establishment worthy of commanding those prices. The food was really fabulous, cooked impeccably and utterly delicious – I’m running out of superlatives, but you get the picture. So next time you have a special occasion, or you just feel like dressing up for dinner, don’t pass Gaucho by. Head right on in and have a lavish time - just make sure you order that steak. A Londoner in Edinburgh, lover of boozy brunches with an incurable sweet tooth - @laurajayne_h.